How’s your Canadian, eh? I ask because today’s Nice Price or Crack Pipe Volvo is located in Montreal, and it’s priced in Canuck Bucks. We’ll just have to see what this hot wagon’s price is all aboot. That doesn’t have to be the case with the weird and wonderful Subaru XT and yesterday’s 1988 Subie XT6 Full-Time 4WD coupe could be just the car to save the model from obscurity. Not only that but with a 66% Nice Price win, it wouldn’t cost an arm and a leg to do so. So, you know what car you never see anymore? Stick shift Volvo V70Rs, that’s what. 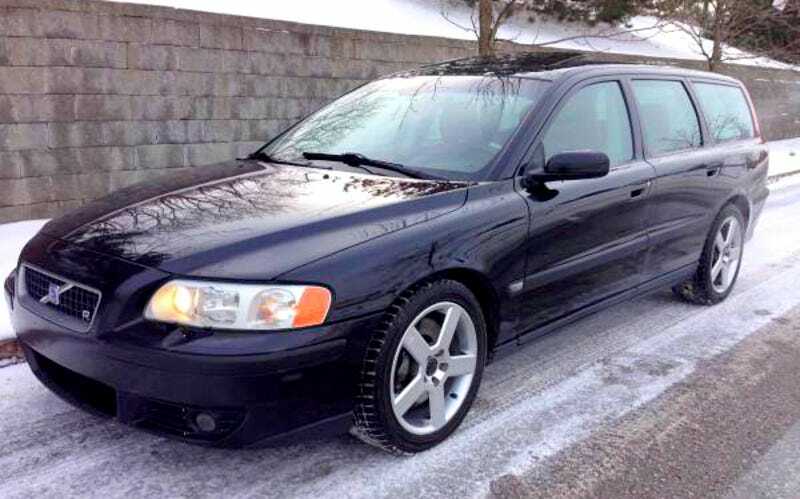 Actually, we had a V70R with its weird spaceball stick a few months back, but that one was in the U.S., and that one didn’t have the crazy color combo this Canadian Volvo family express offers. We’ll get to that in a sec, but first let’s review the specs on this 2004 V70R. Under the hood beats a 300-horse, 295 lb-ft of torque 2.5-litre inline five, imbued with a KKK turbo (man, that company really needs to change its name) and a horsepower pumping intercooler. Next to that is a six-speed manual gearbox that sends power to all four wheels via a Haldex torque-splitting diff. Do I have your attention? It’s also a wagon. Do I now have your interest? The seller describes this 242,000 kilometer (150,000 mile) wagon’s mechanical condition as “A1” which, if this were the military draft,would indicate it’s going to war. On the outside it looks pretty A1 as well, and props to the seller for braving the snow to snap those pics. I hope he made it back inside before the whiteout. It’s on the inside however where the years start to catch up. This V70R was blessed with that orange seat upholstery that Volvo and other makers seemed to think was all that and a bag of Doritos back in the day. Now they’re showing their age, and it’s not pretty. In fact, I think that the seats are a foretelling of how Donald Trump will look at the end of the campaign trail: battered, bruised, cracked, and absurdly orange. The rest of the interior is okay, although being inside it would probably make you feel like you’ve been swallowed by a Jack-O-Lantern. Also, there’s an additional gauge that’s been punched through the dash next to the radio, and some newspaper floor mats. Both of those have some ‘splaining to do. The ad—which sure has a lot of shouty all-caps for being Canadian—notes that this car is being offered as a commercial sale and can be delivered outside of its present Montreal location for a nominal fee if needed. I don’t know, with 300 ponies, AWD and hopefully a good heater, I’d want to drive it out and save the Loonies. I mean, Montreal’s not full of zombies or anything, is it? To do that, a potential buyer will need to scrounge up $4,900 of that Maple Money, which presently equates to about $3,550 U.S. or 30,000 Swedish Krona if you’re heading back to this Volvo’s home town. What’s your take on this Swedish Missile and that price tag? Does that seem like a deal to make this colorful carrier your own? Or, is it just too far ’til Halloween to pay that much for this inside-out pumpkin? Toronto Craigslist (although the car is in Montreal) or go here if the ad disappears. H/T to SnakeRacingCo for the hookup!